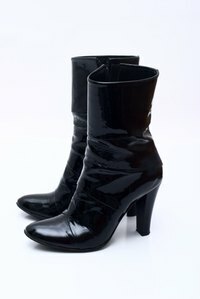 Patent leather has a high-gloss, shiny finish and, typically, a plastic coating to prevent the material from becoming dull. Eventually, normal wear and tear causes all patent leather items to lose their glossy finish, leaving them smooth and dull. However, proper cleaning methods can help patent leather retain its shine longer and prevent the accumulation of dirt and dust. Several commercial cleaners are available today, but the best ways to clean patent leather include using common household items you probably already have on hand. In her book “Talking Dirty With the Queen of Clean,” Linda Cobb recommends cleaning patent leather with warm water and moisturizing soap, which gently cleans without causing unnecessary damage. Before cleaning, brush the surface of the item with a shoe brush to remove as much dirt as possible. Dip a clean, cotton cloth in warm water, and wring out any excess liquid. Rub the cloth on a bar of moisturizing soap to create a lather. Wipe the patent leather surface with the soapy cloth until all the dirt is removed. Dip a separate cloth in clean, warm water and gently wipe the patent leather again to remove soap residue. Finally, buff with a soft, dry cloth. Saddle soap also cleans patent leather, according to the Steve Madden website. Use this method after cleaning with regular soap and water for tougher jobs or when your patent leather no longer shines. Clean the item with regular soap and warm water, and allow it to dry for at least 48 hours before moving on. After two days have passed, dip a soft, clean cloth in saddle soap. Gently buff the patent leather surface with the saddle soap. The leather will absorb the soap, which leaves it shiny and clean. Use another clean cloth to buff and remove any excess soap. This method is especially effective for patent leather shoes. Whole milk cleans patent leather in a pinch, notes Graham Haley, author of “Haley's Hints.” Simply dip a clean, soft cotton cloth into a cup of whole milk, and gently buff the surface of the item using circular motions. Continue buffing until the dirt is gone and the leather appears clean. Buff a second time with a clean, dry cloth or an old nylon stocking to remove residue from the milk, continuing until the surface of the item shines. Use this method when you don't have moisturizing soap or saddle soap available as a temporary fix. Cream hair conditioner cleans patent leather surfaces similarly to saddle soap, explains Jeff Bredenberg in his book “2,001 Amazing Cleaning Secrets.” The leather will also absorb some of the conditioner, which increases the material's shine. Pour a dime-size amount of cream hair conditioner onto a clean cotton cloth, and buff the patent leather until it no longer absorbs the cream. Buff again with a clean cloth to remove any excess conditioner, continuing until the leather shines.